My friend, Laurie, sent me this recipe for Ice Cream in a Bag. I would not have believed it would turn out like ice cream if I had not known someone who it worked for. It is just too simple and I am used to seeing recipes with some sort of “cream” in them. But it does work and it actually tastes pretty good! It was the perfect activity for a morning of 6 busy little bodies to entertain! Step 2: Place zipper baggie in a cup with edges wrapped around the mouth of the cup. Combine milk, sugar, and vanilla in the bag. Seal tightly. I recommend taping it shut with packing tape to make sure it does not leak. Step 3: Add rock salt and ice to larger zipper bag. Place the small sealed bag inside the large bag and seal. Make sure you use lots of rock salt even with the smaller bag. Step 4: Shake and squish for 5 minutes. For us, it ended up being more like 10-15 and maybe that was because we had the quart sized bag instead of the gallon. The next time I make this I am pulling out the oven mitts and snow gloves because it was too cold for my kids to squish past a few minutes. The more you shake it the smoother and more ice cream like it turns out…or you can be like my two kiddos and shove it in the freezer instead of squishing. It still turned out, it was just a little icier of a texture! Step 5: Give the ice cream bag a quick rinse before you open to avoid getting salt in the ice cream once opened. Open bags carefully. Step 6: Now you have yourself a nice yummy bag of homemade ice cream! Add mix-ins and enjoy! Thanks Laurie for sharing this! hello from ne friend fridays! thanks to you and your friend for sharing this recipe! i can't wait for my little one to be old enough to do this with. Brilliant and fun! Thanks for the inspiration! We are going to have to make some ice cream this week! OH my gosh! We are totally doing this. ASAP. 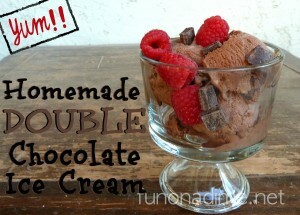 This is the 3rd ice cream recipe on the blog hop this week, but I don't have the ice cream machine yet. Thanks so much for sharing and linkin up to tasty tuesdays!! Great blog by the way! I'm your newest follower! 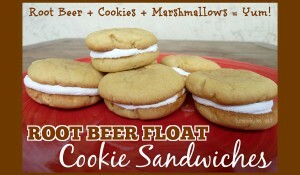 I used to use this recipe to teach liquids and solids and science. I will be saving this and doing it soon. Thanks so much.